Everybody’s Scalin’ For the Weekend – Maximum Overdrive « Big Squid RC – RC Car and Truck News, Reviews, Videos, and More! 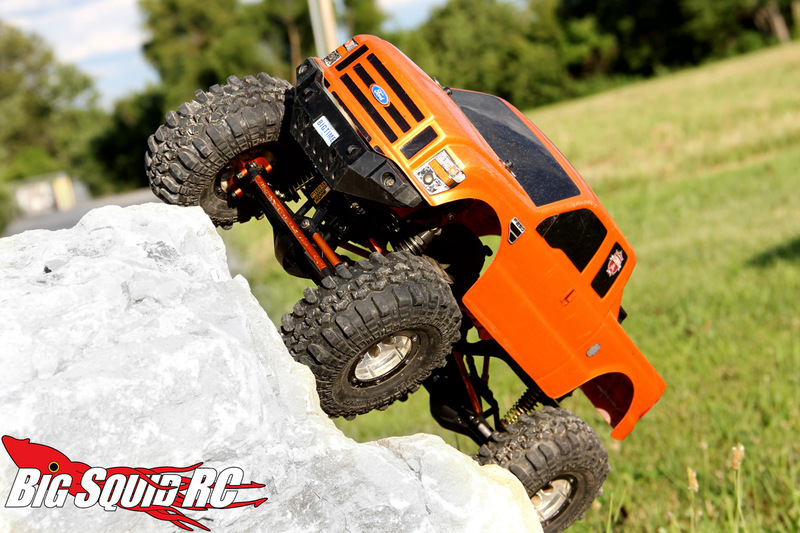 Let’s start with the basics as it relates to r/c crawling: overdrive (OD) means one axle spins faster than another. The opposite of this is underdrive (UD) where, as you may have guessed, one axle spins slower than the other one. These are related in that if you have overdrive in one axle, the other is then underdrive comparatively. The desired effect is achieved by using a taller or shorter ring and pinion gear ratio in one axle versus the other one. Axial currently offers two different modified ratio sets for all of their solid axle trucks. 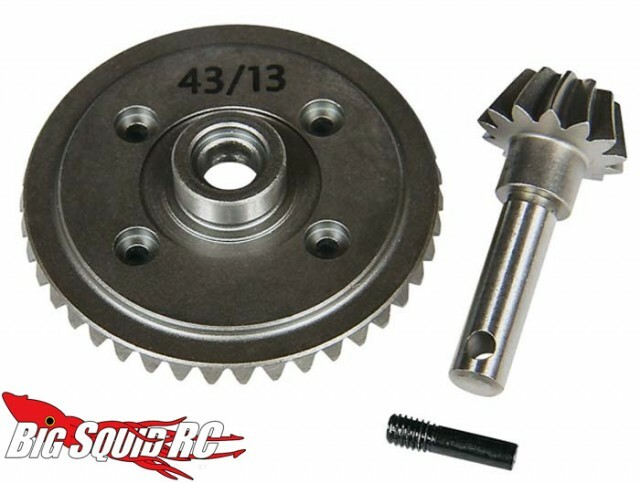 The faster 36/14 (part #AXI30401) gears for OD, and the slower 43/13 (part #AXI30402) for UD. It should also be noted that both sets are made out of hardened steel and are spiral cut to eliminate slop, so in addition to changing vehicle performance they also help bulletproof the drivetrain. They each have a street price of around $27. For a crawling truck you will want the front axle to have OD. This allows the front of the truck to rotate faster therefore “dragging” the rear end slightly. This effect is great for crawling because the front will pull the rear of the truck over an obstacle. You will also be able to turn tighter and won’t see as much torque twist. If you just swap out one set of gears you’ll get a milder OD (putting 36/14’s in the front while leaving the rear stock) you won’t notice a huge difference, but if you swap out both (36/14 in the front, 43/13 in the rear) you’ll have a truck that will climb like a sonuvagun (assuming you have good tires and correct front weight bias, of course). As they say though, there is no such thing as a free lunch. The downside of having axles running at different speeds is that it puts more stress on your drivetrain and can wear out tires faster. The more overdrive you have, the quicker stuff will wear out. Don’t let that scare you though, as the wear isn’t that bad…especially considering the performance enhancement you will gain on the rocks. I’ve been running an OD/UD setup on my main trail truck for about a year and a half now and the only negative thing I’ve experienced was quicker wear of the rear tires, and most of that can be attributed to running around on pavement. Don’t be intimidated by swapping out your axle gears. In the ongoing battle of truck vs. gravity, overdrive may just be the thing that (literally) gets you over the hump. 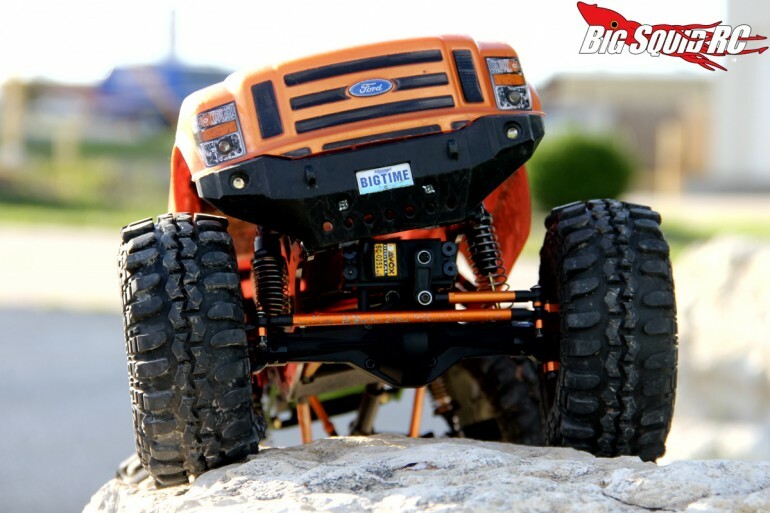 For more Axial news on BigSquidRC click here. For more scale news click here.